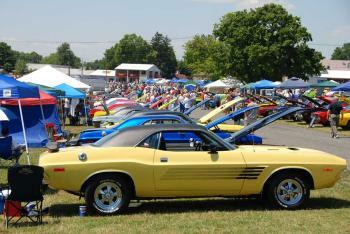 Like most big Mopar Shows, The All-Chrysler Nats, held in Carlisle, PA, is too big to squeeze into the teensy space we have available in our fine publication. 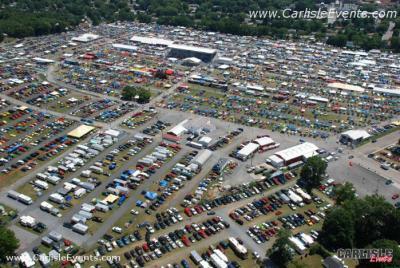 So, for the curious, or for those who happened upon this web page in search of on-line Viagra, we offer these photos, picked off the cutting room floor, to supplement our coverage of the event..
Heres an aerial view of the event, taken from the Mopar Action blimp. If you can see yourself in this photo, wave. All the contestants (at least those that wore bathing suits), in the Miss Carlisles at Chrysler beauty pageant. followed by Carlises own Heidi Haldeman in second. Third place winner was Ashley Pamplin of Baton Rouge, Louisiana. scarfed down 25 wings in less that 10 minutes. Dont talk with your mouth full, Andy. Drag racing action took place at South Mountain Dragway. Heres what the track looked like. Here are some more views of the super-detailed, ready-to-be-installed Hemi engine that was brought to the show by noted restorer, Frank Badalson. The Survivors tent featured cars and owners that were still in very original condition. 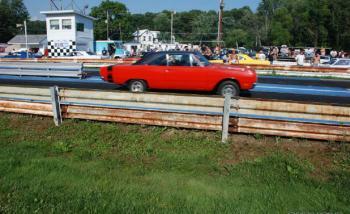 E-bodies were very well represented by Cudas, Challengers and several law firms. 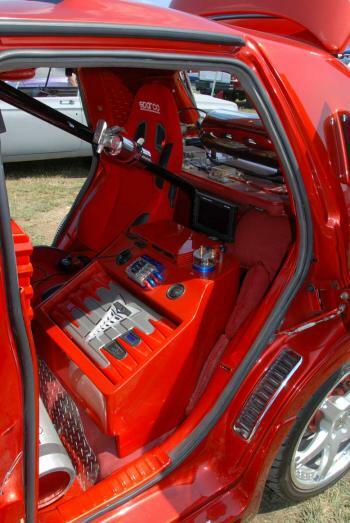 So whaddya do when you finish converting a PT Cruiser to something that looks like it came off the spaceship in Close Encounters? Why, you put it up for sale, of course. We saw this Cruiser undergoing close scrutiny, by a well-heeled, serious buyer from the planet, Pluto. This super-clean 67 D100 Sweptline Special Edition caught our eye (we snagged it on the rearview mirror) in the swapmeet. The truck featured a factory 383, on-dash lever shifter automatic, dual exhaust, factory hood louvers, buckets, console, tow package and more. All for the asking price of $12,500. This one-of-a kind Superbird was rumored to be one-of-4 birds used by the original owner to run moonshine in KY, WV and TN. Its an original V-code 440+6, rebuilt to 525 HP, hooked to a 727 sporting a full-race valve body. The car was restored to as-raced livery. It is lowered 3 inches, and the vinyl top has been removed. The chassis is beefed with frame connectors and LCA stiffeners. The car has race disc brakes, Koni shocks.and circle track torsion bars. This machine rolls on Pirelli P7 P275/55 Z-rated skins. It was autocrossed in the 80s, when running moonshine fell out of fashion. How about an NOS 70 318 crate motor still in its original wrapper for a measly $850? No? OK, How about a poke in the eye with a sharp stick?